EasyTouch Mini Keyboard (White) is rated 4.0 out of 5 by 10. Rated 4 out of 5 by Anonymous from Great little keyboard I wanted a smaller keyboard for everyday use so that my mouse could be closer to the regularly used keys. This keyboard is working quite well. The keyboard has a good feel, and the keys are responsive. They are a little too close together. Also, some of the keyboard layout is a little bit nonstandard, and this was more bothersome than I expected -- the backspace key is quite small, and the right shift key is also small. I found initially I would fat finger these keys frequently. The arrow keys are also right next to the other keys -- I would prefer a small amount of space. Still, the small footprint of the keyboard is great, and I am enjoying using it. Rated 4 out of 5 by Anonymous from Works well I wanted a keyboard without the number pad so that the mouse could be closer to the QWERTY typing keyboard. It accomplishes that goal very well. The only thing I would change would be to have a CTRL key on both sides, rather than just on the left. I have an ALT key on both sides, but rarely use ALT. Since some keys like backspace, and shift are smaller, it takes some getting used to, but it is worth it. Rated 3 out of 5 by Anonymous from OK but not great For the most part this keyboard is pretty good. I was really looking for a compact keyboard without a 10-key. I really like having my mouse that much closer to the keyboard and have learned to use the numbers on the top of the keyboard by touch, so a 10-key doesn't add that much value. This keyboard is OK, not great though. The two biggest flaws are the undersized backspace key and right shift keys. I found myself not being able to backspace reliably. When using the right shift I often hit the up arrow as well as the shift key causing me to select and entire row of text and replace it with my next keystroke. Very frustrating. I overcame the issue by remapping the offending keys. Ideally this keyboard would not have a home, page up, page down, end key where they are. You never see a laptop keyboard sacrifice common keys like the backspace and shift to make room for those keys. Another pet peeve is it force an function (fn) key into the lower right hand corner of the keyboard yet provides no use for it. Ideally the fun key could be used in combination with the arrows to provide page up, page down, home and end. 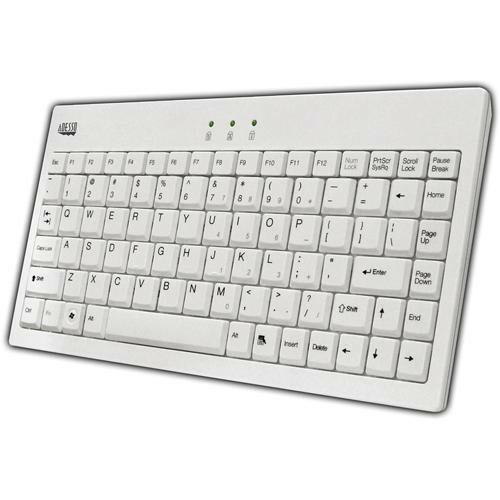 Another great use for a function key is to turn F1-12 keys into media keys which this keyboard does not do out of the box. Rated 5 out of 5 by Boris Chang from Perfect little keyboard Keep in mind, you don't buy a mini-keyboard for extensive word processing or the like. These are for space-saving use. That in mind, the keyboard has a decent action and feel and fits my field recording needs perfectly (it is one of the few mini PS2-compatible keyboards that will work with the Tascam HS-P82 for entering metadata/naming files and so on). It fits on my sound cart and looks like it was made for the Tascam field recorder in terms of color and appearance. Sure, some of the keys on a full-size keyboard are smaller or missing altogether, but be reasonable folks - this is the cost of having a convenient mini keyboard that you can pack into your small gear bag when you hit the road. It works well, has a small footprint, and it doesn't cost all that much. High marks for that. Rated 4 out of 5 by Sunrisefix from Good quality Good touch to the keys, nice compact size ... In a perfect world I would have placed the Delete elsewhere and made the enter key larger but overall a Very Good compact board. Rated 4 out of 5 by Anonymous from Remember it's a mini, not full, keyboard I needed a better keyboard for the woefully inadequate one on my Acer netbook, whose jittery response ruins attempts at typing more than a few words. Rather than buying a new machine, this mini-keyboard is a partial solution. This keyboard worked the moment I plugged it in to my netbook. It doesn't cut off the machine's keyboard, so I can still use the netbook's keyboard for specific functions as volume off/on/up/down. It's small enough to snug up to my netbook in its carrying case. Using the mini-keyboard, like the netbook's small keyboard, means sacrificing the comfort of my full-fledged keyboard I enjoy on my PC. Although my fingers are small, I still have to carefully watch my mini-keyboard typing to avoid hitting the wrong key. The feel of the keys is a step below that of my full keyboard, but it's to be expected. The slight curvature of the keys is better than the flat keys on my netbook. Like the mouse that I use on my netbook rather than the touchpad to increase productivity, the mini-keyboard is a time saver, avoiding needless repetition when my netbook's touchy keyboard wipes of lines of type or drops the cursor in an unwanted space. Rated 2 out of 5 by Anonymous from Cute but uncomfortable The keys aren't laid out too well, but it is small, so if your traveling, it fits great in to laptop bags. Will it work on dos base computer ? Yes, as long as it supports USB. As long as the CD player had a standard USB interface for a computer keyboard, yes. But I am not familiar with the recorder so you should check to see if the recorder supports a PC keyboard.